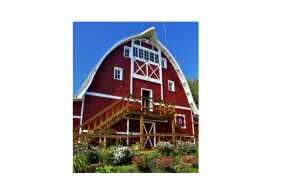 With over 100 years in Bayfield, Hauser’s greenhouse, nursery, orchard and cidery features a scenic view of Lake Superior from the top of its 1928 Sears barn. Farm grown perennials, annuals, hanging baskets, fruit, apples, produce, and cider, along with a variety of homemade jams & jellies, food and gift items. New to Hauser’s – Apfelhaus Cidery! From blossom to bottle. Made right. Right here. Visit today – shop, taste, browse farm relics, and check out our Superior View! Open: May 1 – Oct 31. Featuring bare-root perennial stock grown in our fields to ensure winter hardiness! Also,from our greenhouses a variety of annuals, vegetables, herbs, and beautiful hanging baskets. Also available are fruit trees, ornamental shrubs, and berry plants. Photos and descriptions of most varieties will to help you make your selections! A gift shop with a garden gloves, stakes, chimes, and other items will add that “extra” touch to your gardening experience! Open 7 days a week from 9 am to 5 pm.